Are you trying to decide which Hornady gun safe to buy? 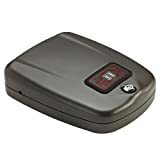 That is what this Hornady Rapid safe review is for, to help you figure out which of their many safes is most suitable. Hornady earned their stripes by manufacturing a lot of quality gun safes. All are made from high-quality materials and have special security features to safeguard your firearm. It is for these reasons why Hornady has become a trusted brand, and the number of safes available makes it an attractive option for gun enthusiasts. The challenge now is learning which one to buy. If you don’t have the time to review the dozens of Hornady gun safes, you can use this review guide as I chose the 5 after reviewing their other products. 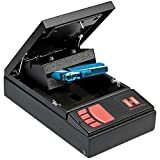 If you want to buy the top Hornady Rapid safe, the following reviews will help. I have also included a buyer’s guide as well. 4 Where are Hornady Safe Made? 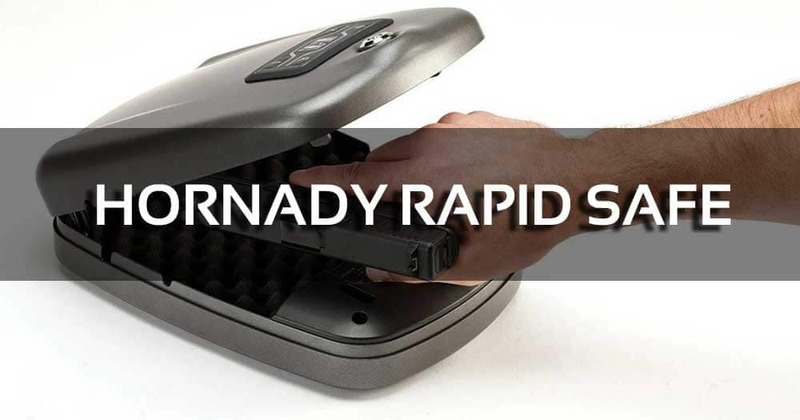 Like the Hornady Rapid vehicle safe, the Rapid Security comes with several features to secure your firearm. Its design is child resistant and offers multiple access points for your convenience. The Security Rapid Gun Safe lets you open the safe via decal, key fob or a wristband. You can also program RFID tags for enhanced security. The Security gun safe is made of 16 gauge steel for extra strength. The locking mechanism is built from 1/4” steel. There are pre-mounting holes on the gun safe so you can mount it quickly. If you want to secure it in your room, all the necessary mounting hardware are provided. The Security Rapid Gun Safe can be run on batteries or AC power. So whether you’re at home or taking the safe on the road, your gun is always accessible. The gun safe has a 1500 lb rated security cable to deter theft. This cable also complements the heavy steel housing and the interior locks. This Rapid safe meets the standards set by ASTM International. The safe also complies with the California DOJ requirements for gun safes. 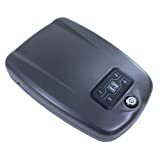 The Security Rapid gun safe allows you to quickly program the keypad. You can enter 4 to 6 digit codes for security. The Hornady Security is a great gun safe, sturdily built and ideal not just for guns but for other valuables. The soft gel wristband in particular is effective. If you read a Hornady Rapid Safe 2700 review you’ll get an idea of what this gun safe can do. It’s got the essential features you’d expect from the Rapid line, plus a few more useful accessories. The safe fits 4 inch revolvers and 1911 size handguns so getting your handgun to fit isn’t going to be an issue. The exterior casing is built from 14 gauge steel so it can withstand heavy use. This Hornady safe is also child resistant. This safe comes with 2 stickers, a key fob, a bracelet, 2 barrel lock keys and 4 RFID tags. Worried that your gun will get stuck inside if the battery or power goes out? No problem as the safe comes with manual keys. By resting the wristband over the button you’ll be able to open the safe. You can also use the decal or key fob. The gun safe matches the requirements set by the California DOJ and ASTM International for gun safety. The Heavy Duty gun safe can run on an AC adapter when you’re at home. You can also use batteries if you’re traveling. The locking lugs are reinforced which makes the safe difficult to tamper with. The Heavy Duty Rapid Safe is one of the most versatile storage solutions available today. It is well built, secures your gun well yet allows quick access. This Hornady 2700kp review can say this is an exceptional gun safe. With its multiple access points and heavy duty built, the 98172 Rapid gun safe is ideal for any gun owner. The 2700kp fits four inch revolvers and 1911 guns, and the 9” x 7.7” x 2” interior provides plenty of breathing room. The gun safe’s security cable allows you to secure it anywhere. Thee 2700kp also meets and exceeds the prerequisites set by the DOJ CA and the TSA for luggage checking. Like other Hornady gun safes, the 2700kp is designed to run on electrical power or batteries. This gives you more options for using the gun safe. The 27000kp is built to withstand tampering. 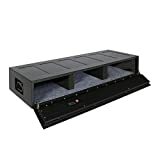 The entire unit is comprised of 14 inch thick steel fortified with locking lugs. The 2700kp was built to keep your gun safe from children. The lock is child resistant and even adults will have a difficult time cracking it. The 2700kp was tested heavily prior to being released. To ensure safety and security, the gun safe underwent drop/saw/pick tests, lock strength tests and also prying resistance. You can use the RFID, manual keys or sticker to open the safe. The package includes a security cable, 2 circular barrel keys, an RFID key fob, 2 RFID stickers, the RFID wristband and power supply. The 98172 is an excellent gun safe, combining high end security features with convenience.. For durability and versatility the 98172 is worth considering. HEAVY-DUTY, TAMPER PROOF CONSTRUCTION: Exterior housing is made of thick 14-gauge steel with two internal hardened locking lugs. The 2600kp is one of the better gun safes that Hornady has made. With its RFID technology, your firearm is always available. The 2600kp can be opened in several ways including RFID, a sticker or the key chain. 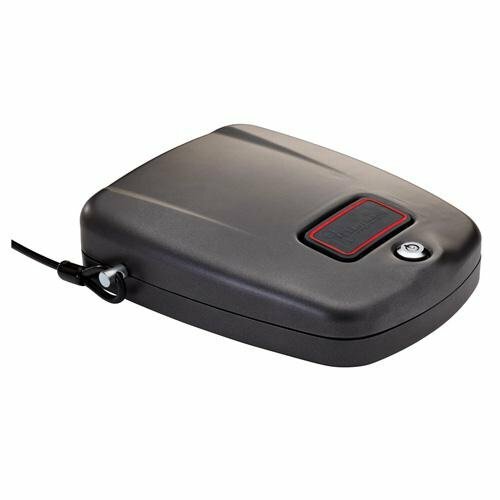 Up to 5 RFID tags are programmable and you can also open the safe with the supplied key. The 2600kp exceeds the ASTM standards for safety. It has also been evaluated against tampering, prying, dropping and lock picking. The 2600kp gun safe is made of 14 gauge steel for extra strength. It also comes with fortified lock lugs to prevent prying and tampering. The 2600kp has a spacious interior that’s sufficient for large handguns, making it the ideal solution if your old gun safe is too cramped. The 2600kp is compatible with an AC adapter and batteries, giving you the opportunity to choose the best option. The RFID wristband simplifies access to the gun safe, and it’s just as convenient to use the keypad. If you want to open the traditional way, keys are provided. The 2600kp has holes pre-drilled so you can mount this without complications. The 2600kp gun safe comes with a detailed instruction guide so even if you have never used a Hornady gun safe before, you will know what to do. The 98177 2600kp is a heavy duty gun safe, dependable at home or your vehicle. It’s really child resistant and yet remains easily accessible. Weight: 50 pounds. CONVENIENT KEYPAD ACCESS: For secondary entry method, user can program a four to six digit security code. You’re not likely to run into Hornady Rapid safe problems with the AR Gunloacker. It’s got the same level of security like the other RAPID safes, but it’s made for longer, bigger guns. The Gunloacker is enclosed so you can put it in your vehicle, under your bed or mount on a wall. The interior accommodates 2 shotguns or 2 rifles. The foam inserts provides firearms protection. The Gunloacker is made of 16 gauge steel and equipped with heavy duty locks for extra protection. Mounting holes are pre-drilled and a security cable are included as well. 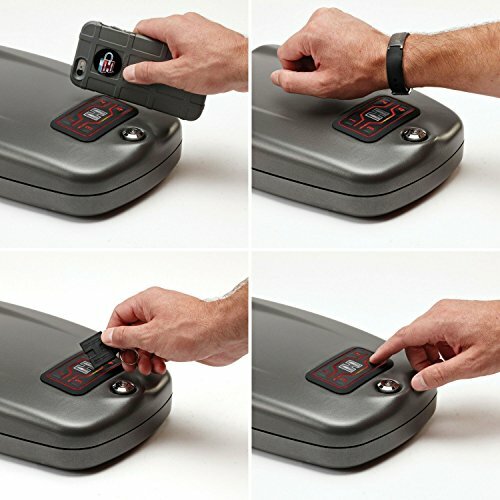 The Gunloacker comes with a RFID wristband so you can open the safe quickly. You can program 5 RFID tags or use the key chain or sticker. The Gunloacker has a keypad that allows you to program 4 to 6 digits for added security. The Gunloacker meets the ASTM requirements for gun safety standards. It has also been tested for pry and child resistance. This gun safe is built to withstand hinge resistance attacks, drops, lock picking and forcible entry. The Gunloacker can run on AC for continuous power supply. You can also use batteries if you carry it in your vehicle. The Gunloacker is an excellent gun safe for short and long firearms. Its RFID works very well and it’s also easy to use. Hornady is a US company that manufactures hand loading parts, ammunition, gun safes and related accessories and products. The company is located in Grand Island, Nebraska. Hornady was established in 1949 by Joyce Hornady along with Vernon Speer. At the end of World War II, Hornady started purchasing surplus gear from the government while making their own products. Since that time Hornady has expanded its product line and includes gun safes, defense loads, hunting and shooting rounds. Hornady is also known for developing the .17 HM2 and .17 HMR, .375 Ruger, .204 Ruger and .480 Ruger cartridges. Hornady also manufactures the LEVERevolution ammunition that uses an elastomer tip and spitzer bullet for superior performance. The company also makes a wide array of handloading parts such as shotgun shell components, bullets and cartridges. While Hornady makes a lot of products they’re still best known for gun safes like the ones I reviewed here. Where are Hornady Safe Made? Hornady safes are made in the United States, and each one undergoes rigid quality control. Their Rapid gun safes are manufactured using proprietary methods for enhanced protection and precision. Hornady Rapid Safes use RFID technology to provide quick and convenient access. The most innovative techniques are used for its construction. Hornady takes all the steps necessary to ensure each gun safe meets the ASTM standards for safety. Everyone who works on these gun safes are properly trained so you’re assured each one is built to the highest standards. This applies not just to Rapid Safes but all Hornady products. Built to Last: all Hornady safes are made from heavy duty gauge steel for additional strength. The interiors are also fortified to protect your firearms. Multiple Options Available: do you need a compact safe for just one pistol? How about 2 handguns? Looking for a storage solution for your shotguns? There’s a Hornady gun safe for your needs. Tamper Resistant: all Rapid gun safes are built to withstand prying and tampering attempts by kids and intruders alike. Easy to Access: Hornady safes offer a multitude of ways to access your gun like manual keys, key chains, keypads and RFID wristbands and decals. Patented Technology: all Hornady gun safes use the latest technology for easy and reliable access. 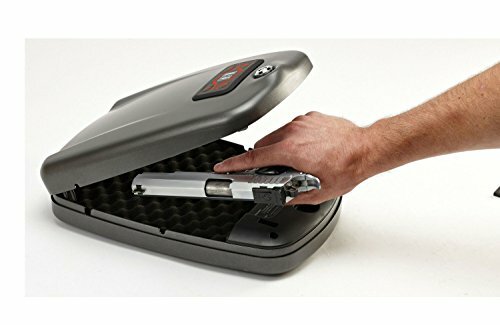 Portable: these gun safes are compact, lightweight and easy to carry around. Even the Hornady shotgun safes are lighter compared to other gun safes being sold today. Open your gun safe using the key code, a programmed RFID tag or the supplied key. Find the red program button. Press the button and let go to start programming an RFID tag. One of the slots should start blinking. Hold and position the tag an inch from the lit RFID on the lid. Once programmed the safe will blink 2 times. The blinking slot turns a solid red for 10 seconds. Hold the RFID tag you programmed over the RFID reader. This should open the gun safe. If the safe does not open, reprogram it following the steps above. You can program up to 5 RFID tags. You can enter a 4 or 6 digit code in any Rapid safe. Open the safe with an RFID tag, key code or key. Press and release the red program button. The first available slot tag starts to blink. Once the lid is open, submit a 4 to 6 digit code. Tap the H once you’re done entering the code. Reenter the code and tap H again to verify your code. Try the key code and it should work. Note: these gun safes have a green sensor that indicates the lid is closed. Blinking red means the safe is still closing. Hornady gun safes are well designed and provide a lot of benefits and security. Compared to other gun safes you’ll feel more secure with these. The portable nature of these gun safes means they’re ideal for home, vehicles and travel. But the clear winner from the 5 here is the Hornady Security Rapid Gun Safe. It is very easy to use, made from durable materials and is resistant to tampering. The Hornady Security Safe earns the highest score for its very responsive RFID tag and the wristband and decals are easy to program. After conducting this Hornady Rapid safe review I can say the Security Safe really keeps you secure.